Animals have been suffering in the heatwave we've had recently - I've seen several reminders on Facebook not to walk dogs during the hottest part of the day. My cat spent several days moving from one spot in the living room to another, seeking out the coolest bit of floor, so when I saw this idea on the internet (on Facebook again actually) I decided to give it a go. 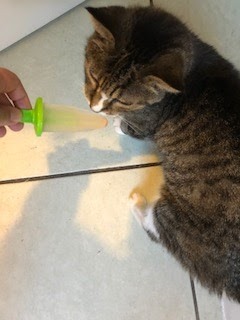 Tuna ice lollies for cats - whatever will they think of next?! 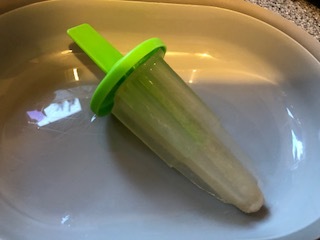 To make these, you simply mix the liquid from a tin of tuna in spring water (rather than brine which is too salty), with a little tap water, and freeze them in ice lolly makers. To get the lollies out, stand the mould in a bowl of boiling water for a few seconds. Unfortunately my cat didn't seem particularly interested but I have seen videos on the internet of cats licking these so apparently they do work at least with some animals!